The amphibious dock landing ship USS Ashland (LSD 48) launches a Rolling Airframe Missile (RAM) during a missile exercise (MSLEX) in the Pacific Ocean, March 16, 2019. MSLEXs are designed to increase the tactical proficiency, lethality, and interoperability of participating warships in an era of great power competition. US Navy photo. Naval forces forward-deployed in the Pacific took a big step in raising their warfighting proficiency, completing their first advanced training event hosted by the Naval Surface and Mine Warfighting Development Center (SMWDC). Because Forward Deployed Naval Forces (FDNF) forces in Japan are already located in their warfighting theater, their training cycle differs from U.S.-based forces. Importantly, after a ship undergoes maintenance its crew is only put through a short basic training cycle before U.S. 7th Fleet commanders can begin tasking them with assignments. On the other hand, U.S.-based forces undergo not only basic training but also integrated and advanced training exercises before heading overseas on deployments. 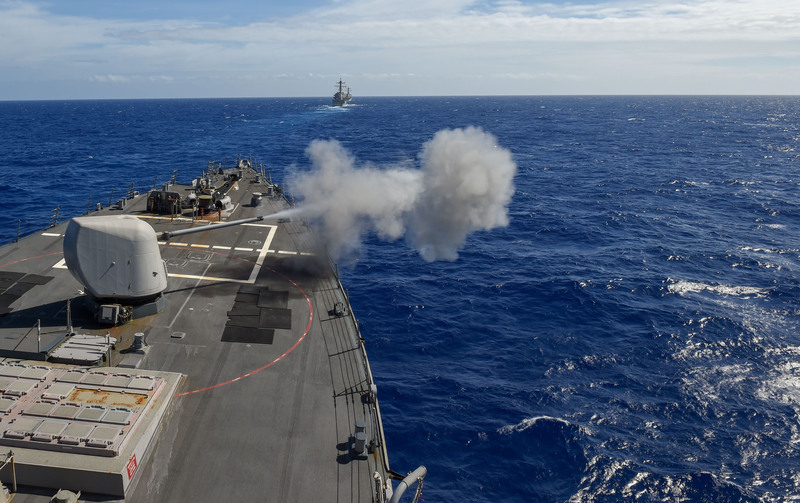 Since 2016, that advanced training has been the Surface Warfare Advanced Tactical Training (SWATT) event hosted by SMWDC, which includes live missile shots and other high-end tactics to prepare the crews for whatever they may face on deployment. 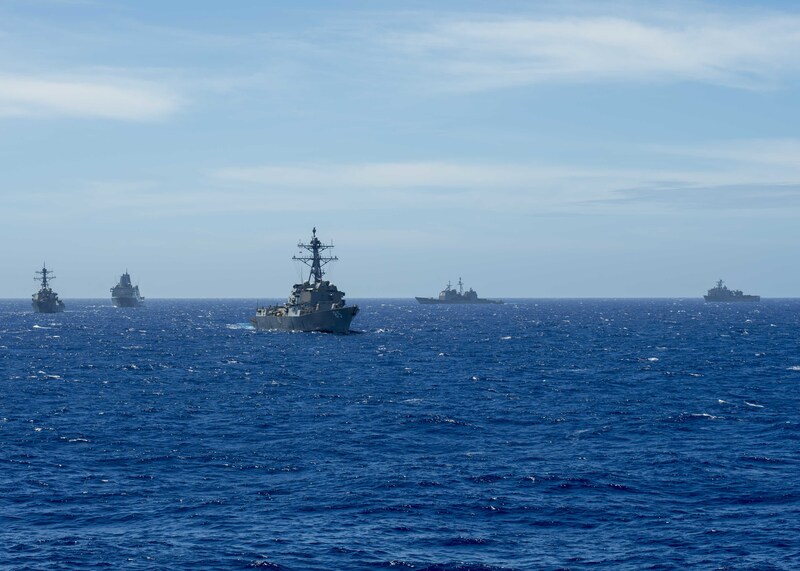 In mid-March, four surface combatants and two amphibious ships conducted the first-ever SWATT in 7th Fleet, bringing this high-end training to the forces most exposed to interactions with foreign navies like China and Russia. “Without going into the specific day-to-day schedule, advanced training events focused on multi-ship, multi-platform responses to complex threats. For example, there were several live-fire events involving multiple ships and targets,” 7th Fleet spokesman Lt. Joe Keiley told USNI News. Photos and videos from the SWATT show launches of the Standard Missile-2, Rolling Airframe Missile and Mk 46 torpedo, as well as live fire from the Mk 45 five-inch gun, among other components of the advanced training event held in the Philippine Sea. “The recent Surface Warfare Advanced Tactical Training event is the closest FDNF-J ships have come in terms of parity with SWATT events for CONUS-based ships. Training events focused on developing the same advanced tactics and to the same standards,” Keiley said. The Arleigh Burke-class guided-missile destroyer USS McCampbell (DDG 85), the Arleigh Burke-class guided-missile destroyer USS Milius (DDG 69), the amphibious transport dock ship USS Green Bay (LPD 20), the Ticonderoga-class guided-missile cruiser USS Chancellorsville (CG 62), and the amphibious dock landing ship USS Ashland (LSD 48) maneuver while operating in the Philippine Sea on March 14, 2019. US Navy photo. 7th Fleet’s OFRP-J force-generation model, which went into effect in early 2018, keeps ships ready for planned or emergent tasking in their busy theater but also breaks out time for ship maintenance and training. Ships may return to Japan for short maintenance periods, but after any months-long maintenance availabilities the ship’s crew must undergo an 18-week basic phase training and certification. “Unlike CONUS-based ships which are geographically separated from their area of operations, FDNF-J ships are available for operational tasking as soon as they complete the basic phase and enter sustainment. During the sustainment phase, ships will have opportunities to complete advanced and integrated training as part of their schedules,” whereas U.S.-based ships would do that integrated and advanced training before heading out on a deployment. 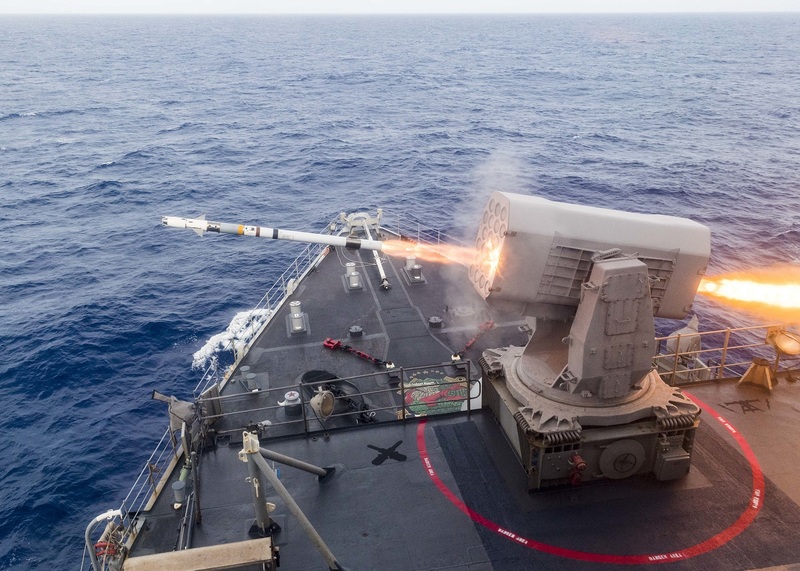 Arleigh Burke-class guided-missile destroyer USS Milius (DDG 69) fires its Mk 45 5-inch gun during training with other U.S. Navy warships on March 14, 2019. U.S. Navy warships train together to increase the tactical proficiency, lethality and interoperability of participating units in an Era of Great Power Competition. US Navy photo. Forces homeported on the East and West coasts of the United States have used a 36-month Optimized Fleet Response Plan to balance maintenance, training and operations since 2014. The cycle begins with a six-month maintenance period, followed by basic and integrated/advanced training, a seven-month deployment, and then a sustainment phase that could be used for either a surge deployment or readiness-maintaining exercises at home. Since 2016, SWATTs hosted by SMWDC have been woven into the training period, serving as a final high-end event before strike groups head out on deployment. Keiley said the OFRP-J model was implemented early last year and that most 7th Fleet ships have already completed maintenance and basic phase training and certification under this model. He said the time was right, with that model now in place, to look at adding advanced training for 7th Fleet ships – even if during the sustainment rather than post-maintenance training like the CONUS forces. “Combined with routine operations and exercises in 7th Fleet, this type of training carves out more time to sharpen skills and develop lethality at sea,” he said, adding that 7th Fleet ships conduct high-end training throughout the year but that the addition of SWATT allows them to work with SMWDC to ensure they are fighting with the best and newest tactics and to the same proficiency as East Coast and West Coast ships. In contrast to the CONUS ships, which conduct separate SWATTs today for the surface combatants in a carrier strike group and the amphibious ships in an Amphibious Ready Group, the 7th Fleet SWATT combined the two. Included in the event were guided-missile destroyers USS Milius (DDG-69), USS Curtis Wilbur (DDG-54) and USS McCampbell (DDG-85); guided-missile cruiser USS Chancellorsville (CG-62); Whidbey Island-class dock landing ship USS Ashland (LSD-48); and San Antonio-class amphibious transport dock ship USS Green Bay (LPD-20). “7th Fleet operates cruisers, destroyers and amphibious ships independently, or aggregated as part of surface action groups, amphibious readiness groups, carrier strike groups and expeditionary strike groups. SAGs and ESGs are composed of both types of ships, and so advanced tactical training like this provides mixed forces more opportunities to train together and also focus on surface warfare commonalities across the force (e.g., ship-handling),” Keiley said. For more about SMWDC, see the Jan. 17, 2019 edition of The Proceedings Podcast.